Choose different species from drop-down list and press 'Go' button. See Full species list. The Marsh Widowbird was formally described by Jose Vicente Barbosa du Bocage, a Portuguese zoologist and politician. He was curator of the Lisbon Museum, and described several other weavers. The Marsh Widowbird was collected by Jose Alberto de Oliveira Anchieta, a Portuguese explorer and naturalist, who collected a large number of birds in Angola. In 1867 the Portuguese government hired Anchieta as a naturalist but probably also as a secret agent and informer in the Caconda region of Angola. Anchieta lived in Caconda, explored the area and sent many specimens and letters to his scientific correspondents in Lisbon. Anchieta discovered the Marsh Widowbird near Caconda, and sent a single male specimen to the Lisbon Museum. Bocage measured the tail as 160 mm, while tail length in the nominate subspecies is usually 163-201 mm. 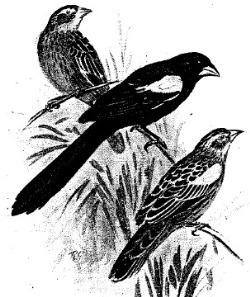 The first illustration of the Marsh Widowbird was published in Delacour (1933). 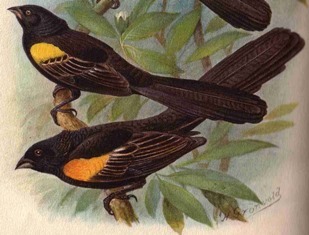 The second illustration was published by Bannerman (1949), as a black and white sketch, but also showing the female and non-breeding male. Penthetria hartlaubi	Bocage 1878	Jorn. Sci. Math. Phys. Nat. Lisboa, 6, p.259	Caconda, Angola. hartlaubi, After Karl Johann Gustav Hartlaub (1814-1900) German ornithologist and author. Hartlaub's Widow Bird (Layard 1884). Hartlaub's Marsh Whydah, Hartlaub's Marsh Widowbird, Marsh Whydah, Uganda Marsh Whydah. The type specimen was in the Museum of Lisbon, before a fire destroyed the museum. The above is based on Weaver Wednesday 2, a weekly series about the discovery of each weaver species. Identification. 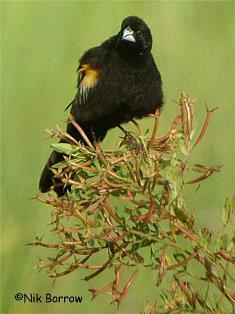 The Marsh Widowbird breeding male is black with a long tail, white bill, and yellow or orange and buff shoulder patches. The patches resemble those of the Fan-tailed Widowbird but the tail is longer in the Marsh Widowbird. In Kenya the similar Yellow-mantled Widowbird has yellow epaulets while these are orange in the Marsh Widowbird, and further south the Yellow-mantled Widowbird is distinguished by a yellow mantle. The non-breeding male Marsh Widowbird is dull with coloured epaulets and dark wings. The female is dull with a dusky underwing and buff underparts. 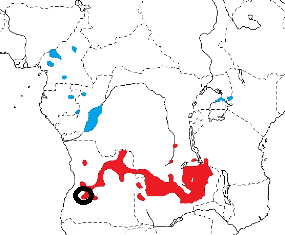 E. h. hartlaubi, in Angola, DRCongo, Zambia and Tanzania in the Ufipa region (see red on map). 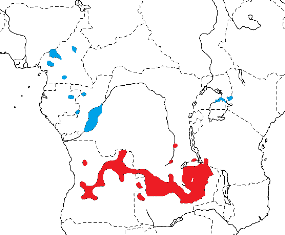 E. h. humeralis, in Nigeria, Cameroon, Gabon, Congo, DRCongo around the Congo River, Uganda and Kenya (see blue on map). This race differs from the nominate in size, and the breeding male has a much shorter tail. Habitat. The Marsh Widowbird inhabits swampy grasslands and nearby cultivated areas. It may visit deeper water in reeds, perching on floating lily leaves or other floating vegetation. Food. The Marsh Widowbird feeds on grass seeds, insects including grasshoppers and small fruit and berries. It usually forages in small groups, often with other widowbirds. Breeding. The Marsh Widowbird is polygynous. The nest is spherical, with a side entrance. The male builds the outer frame of the nest, using fine grass stems and incorporating living grass, which forms a bower over the nest. The female adds lining of dry grass, and continues to add lining after the first eggs have been laid. The nest is placed low down, usually within 20 cm of the ground, in wet areas with dense grass. The clutch is 1-3 eggs, which are pale greenish-blue or olive-green, marked with spots and blotches. There is no other information on breeding. The above is based on Weaver Wednesday, a weekly series about weaver species. Breeding information based on Handbook of the Birds of the World, Vol. 15. No records yet - be the first to submit a PHOWN record! See PHOWN summary page for this species here. PHOWN (Photos of Weaver Nests) provides valuable info on breeding distribution and colony sizes of weavers. You can contribute by registering and submitting photos at Virtual Museum webpage. yellow blob - range of weaver species; read more about this here. CLICK on the marker on the map to see individual record details. The above is based on Weaver Wednesday 3, a weekly series about range changes in South African weaver species.